My interest in coins began about 50 years ago, when as a third grader, I began my collection by saving Lincoln Cents out of circulation, in a blue Whitman Folder. My collection and fondness for the hobby grew over the years, and while in High School and college, I bought and sold coins at local coin clubs and coin shows. During the summer, I worked in the steel mills in East Chicago, IN, and Gary, IN. Finally, I realized it was easier making profit by selling coins than working in the local steel mills. I founded Knight Coin & Stamp in 1966, in Gary, IN. In 1972, I moved to nearby Hobart, IN. 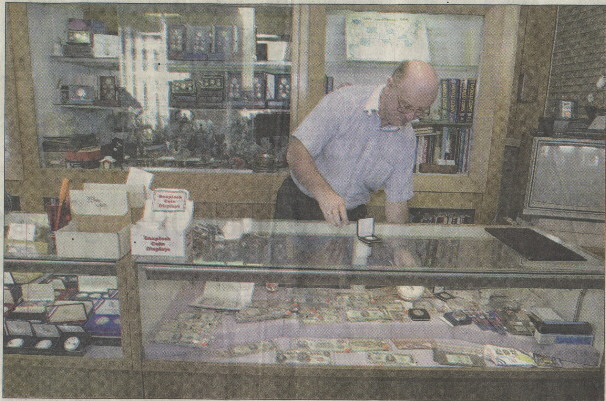 In 1994, I purchased The Jewel Shop, a full service jewelry retail store, and a fixture in downtown Hobart for 35 years. I was born in Gary, IN, in 1943, and graduated from Gary Tolleston High School in 1961, and Valparaiso University in 1965. I am life member number 867 in the American Numismatic Association. I also collect antique pocket watches, and am a member of the National Association of Watch and Clock Collectors since 1973. I am a past president of our local Peace Pipe Chapter. My wife, Mary, and I were married in 1968 and have two adult children, John and Bridget.